AVA Little Tokyo brings together modern downtown living, ecofriendly construction, and a reduction in energy use for ownership and tenants. The project, recently awarded LEED Gold, consists of two six-story mixed-use apartment buildings located in Downtown Los Angeles’ Little Tokyo District. Located at the intersection of the Civic Center, Gallery Row, and Little Tokyo, the project links these three districts together. Due to its proximity to bus lines and light rail, AVA Little Tokyo earned exemplary performance in Alternative Transportation – Public Transit. The project also earned a LEED pilot credit for Street Network for the great density of intersections in the surrounding area. 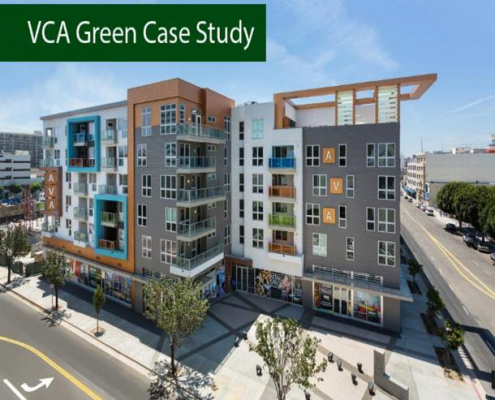 VCA Green was proud to be the green consultant of record for this innovative project. Why the Developer Chose LEED? AvalonBay Communities is committed to social and environmental sustainability throughout their portfolio. From 2012 to 2013, AvalonBay saw the number of their communities pursuing LEED or other environmental certifications jump by 78%. LEED is seen as a premier industry benchmark that will help measure sustainable performance, and AvalonBay benchmarks energy usage throughout their portfolio. Value is derived from better planned, designed, and built properties. The residents of Avalon Bay properties are 83% satisfied with their homes compared to an industry-peer average index of 76%. AvalonBay believes that their LEED certified buildings help contribute to these higher satisfaction ratings. The site was chosen specifically to give residents greater access to restaurants, culture, transportation, and everything downtown LA has to offer. The project is located near bus lines and the Gold Line light rail station, providing tenants the ability, and choice, to take alternative means of transportation. Within a quarter mile walking distance are restaurants, stores, and other services that reduce the need to use a vehicle or to park a vehicle in a densely developed environment. AVA Little Tokyo also enjoys the advantage of having well insulated units with LED lights, which reduce tenant operating costs and extends equipment life. Turf or grass, which generally requires large amounts of watering, was not installed on the project. Drought-tolerant plants with drip line irrigation conserve water and reduce watering costs. A weather-based irrigation controller prevents watering in the event of rain. High- efficiency fixtures, including low-flow showers, faucets, and toilets, were installed in every unit. AVA Little Tokyo exceeds California standards for energy usage by more than 18%. This was achieved by installing high-efficiency HVAC units and water heaters. High-efficacy lighting is used throughout the building and in all units. Ductwork is well-sealed only allowing 6% or less leakage. This means that most of the conditioned air in units will be delivered to the occupant and not interstitial spaces. Superior insulation allows for a more comfortable unit that requires less heating and cooling. All and all, these measures save tenants approximately 30% on energy costs annually. Residents have been quoted on how they like lower utility bills and how much they like the energy efficient appliances and lighting. The heat island effect is caused by the sun’s heat striking surfaces such as parking lots, steel, and glass structures which absorb then give off heat. Vehicle parking for AVA Little Tokyo is located entirely underground, which maximizes space and helps to minimize the urban heat island effect. AVA Little Tokyo’s roof consists of a white membrane, which keeps upper units cool and which helps reduce the heat island effect. Cooler units also means air-conditioning systems will operate less – saving tenants about 15% to 20% on cooling costs and saving ownership wear-and-tear on equipment. 80% of waste generated by construction was reused, recycled, or otherwise diverted from landfills. Environmentally preferable wood products were used throughout the project. The foundation’s aggregate and insulation in the building both contain recycled content helping reduce the need for virgin resources. During the design process the project team developed a detailed cut list for the lumber used in the framing of the building. This pre-cut lumber was delivered to the construction site reducing the waste that comes from cutting lumber on site. Delivering panelized lumber to the site saves labor and material costs since wall, floor and roof sections are assembled in an efficient factory environment. Indoor Air Quality is an important factor in green building and contributes to the health and wellbeing of the tenants. AVA Little Tokyo is a smoke-free building reducing exposure of occupants to second-hand smoke. The MERV 8 air filters are above industry standard and help trap and capture more a greater number of airborn-pollutants. All units provide fresh air directly to units, and a low volume, continuously running exhaust fan helps ensure stagnant or moist air is not trapped for extended periods of time. Bath fans have automatic humidistats which turn on automatically when moisture levels increase within bathrooms. Paints, primers, sealants and glues, as well as carpeting and flooring, used on the project contain low quantities of harmful volatile organic compounds (VOCs), which are harmful when inhaled. Combined, these measures help ensure better indoor air environment and may help minimize a condition known as sick building syndrome.